Welcome to our Christmas Forest. celebrate Christmas. 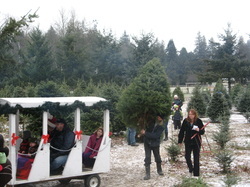 A walk through our Christmas Forest to find the perfect tree is followed by a complementary wagon ride and a warmup around a cozy fire with hot chocolate. We help create a fantastic Christmas Experience with wonderful memories that sustain families throughout the year. Merry Christmas to all....we are open for the the 2018 Season beginning November 24 (Thursday through Sunday)....we look forward to seeing you all again in 2018.